INDIANAPOLIS – One year ago, Ryan Briscoe found the Indianapolis Motor Speedway wall during Pole Day practice prior to attempting to qualify for the 100th Anniversary Indianapolis 500. He battled back to field his car in the 26th spot that day. Fast forward to 2012 and Briscoe is a little happier – especially after taking his No. 2 IZOD Team Penske Chevrolet to the pole position of the Greatest Spectacle in Racing in the closest finish ever between the top two spots. Briscoe’s four-lap time of 2 minutes, 38.9514 seconds (average speed of 226.484 mph) in the 90-minute shootout for the top nine qualifiers bested the time of 2:38.9537 (226.481) posted by James Hinchcliffe to earn the pole position for the 96th Running of the 500 Mile Race. Roger Penske, team owner of the pole sitting car, gave credit to a strong team during the qualifying effort while giving thanks to the team members families. The legendary owner also remembered a lost member of the Penske family. “It is all about our people, the team, and certainly Ryan (Briscoe) needed this one,” said Penske. “He’s done a great job for us. (And) the guys did a great job. It was just a pleasure to bring that Chevrolet engine down home to the front with IZOD as our sponsor. I want to thank everybody that has supported our team for so many years, especially the families. The time differential of 0.0023 of a second is equivalent to 9.168 inches over the four laps. The 1970 time trials yielded a difference of 0.01 of a second between pole winner Al Unser (3:31.49) and Johnny Rutherford. “Yeah, the smallest of margins; it’s heartbreaking in a sense,” said Hinchcliffe, who recorded the best lap of the session (39.6591 seconds on Lap 1 of his second attempt). “I’m going to lose a little bit of sleep over how small that margin was to Ryan and knowing that we had it there for three laps, but you know that’s Indy. It’s a gust of wind, it’s a shadow over a corner that changes and that can be the difference. Briscoe is the first Australian citizen to sit on the pole at Indianapolis and it’s the 17th pole start for team owner Roger Penske at the Speedway. Scott Dixon was born in Australia but claims New Zealand as his homeland. “A week ago I didn’t think we’d have a shot for the pole,” said Briscoe, whose best Indy 500 finish is fifth in 2007 in his only IZOD IndyCar Series race of the season. Briscoe and Hinchcliffe, competing in his second Indy 500, will be joined on the front row for the 200-lap race May 27 by Ryan Hunter-Reay (226.240). It’s the first time brothers-in-law (Hunter-Reay and Robby Gordon) have started on the front row. Andretti Autosport teammate Marco Andretti, IZOD IndyCar Series points leader Will Power and four-time pole sitter Helio Castroneves will be on Row 2. Rookie Josef Newgarden — the only Honda driver in the shootout – and KV Racing Technology teammates Tony Kanaan and E.J. Viso will share Row 3. Kanaan had his first qualification attempt disqualified because the team did not add the required ballast weights to the car. Alex Tagliani, the 2011 pole winner with a four-lap average speed in the shootout of 227.472 mph, checked in at 11th in the No. 98 Team Barracuda-BHA car. Team co-owner Bryan Herta won the 500 Mile Race last year with driver Dan Wheldon. Target Chip Ganassi Racing teammates Scott Dixon and Dario Franchitti, who have three Indy 500 wins between them, will start 15th and 16th, respectively. Michel Jourdain Jr., who last competed in the “500” in 1996, qualified 22nd in the No. 30 Office Depot/Rahal Letterman Racing car. Sebastian Saavedra, who will “do the double” of competing in the Freedom 100 and Indy 500 for the second time, cracked the top 24 with one minute left in Segment One. His four-lap average speed of 222.811 mph bumped Wade Cunningham to Bump Day. On Sunday’s Bump Day, Carpenter, Clauson and Servia were joined by six other drivers who filled the Indy 500 field with the traditional 33 drivers. But as commentator Derek Daily said, it was really “Bubble Day” as no bumping was attempted with only 33 drivers attempting to qualify this year. Their crews put in multiple hours rebuilding their cars and, in Carpenter’s case, preparing the backup after crashes on Pole Day. Servia’s No. 22 Panther/Dreyer & Reinbold Racing car was quickest (223.752 mph) of the nine non-qualified cars in the morning practice session, while Carpenter tested the No. 20 Fuzzy’s Ultra Premium Vodka car after the track opened for time trials. Servia, the fourth to make a qualifying attempt on Bump Day, recorded a four-lap average speed of 222.393 mph. Clauson’s No. 39 Sarah Fisher Hartman Racing car posted an average of 214.455 mph, while Carpenter was the final qualifier and turned a 222.324 mph average. All three allowed themselves a few moments to decompress before returning to the 2.5-mile oval to apply their race set-ups on a humid afternoon that is forecast to be matched on Race Day. Sebastien Bourdais, who was bumped from the top 24 set on Pole Day, was the fastest qualifier on Bump Day with a four-lap average time of 223.760 mph. He’ll be joined on Row 9 by Indy 500 rookie Wade Cunningham (223.258) and Servia (222.393). Carpenter is on the inside of Row 10, alongside Mike Conway (222.319) and Katherine Legge (221.624). 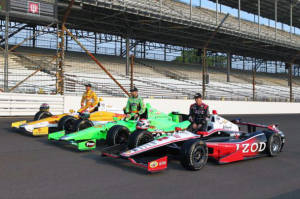 On Row 11 are Clauson (214.455), Simona de Silvestro (213.393) and Indy 500 rookie Jean Alesi (210.094). The Indianapolis 500 will be run on Sunday and will be televised on ABC, although local blackouts will be in effect for the Kokomo area. A rebroadcast of the race is set for 7 p.m. on WRTV Channel 6.